She founded the Centre for Sustainable Development of the Americas, a non-profit think tank for climate change policy and capacity-building which she directed until 2003. Previously, she served as Director of the Technical Secretariat of the Renewable Energy in the Americas, at the Embassy of Costa Rica in Germany, and as Director of International Cooperation in the Ministry of Planning in Costa Rica, and was Chief of Staff to the Minister of Agriculture. 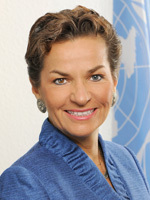 Ms Figueres holds a Masters Degree in Anthropology from the London School of Economics and a certificate in Organizational Development from Georgetown University, and is a widely published author on the design of climate solutions.